petition: Don't Let Them Kill 45,000 Wild Horses and Burros! Recently I went to a short term holding facility to help rescue some 3-Strikers and made this short video of Snowbunnie (#2256) and Suzie King (#2473) 3-Strike Friends. You can see they were interested in being saved. After seeing the video, someone came forward to take the pair and give them a loving forever home. Sadly, the BLM made it difficult and unpleasant for the potential new owner, who was in tears at one point because the BLM was giving her such a hard time with the paperwork. I provided support to keep everything on track and then shortly afterwards we delivered the two 3-Strike mustang mares to their safe forever home. Since the BLM is not doing their job to publicize available wild horses and burros, and since their customer service is rotten, it's wrong to call the 45,000 captive wild horses and burros "unadoptable". They were not given a fair chance. Now the BLM wants to KILL them all. Sign this petition to ask that the BLM put all the wild horses and burros back on public land to save tax-payer dollars and safeguard their lives. If needed, water wells could be drilled in Herd Areas thus still saving taxpayers millions of dollars. It's time to restore the natural ecological balance in the West, prevent catastrophic wildfires and #PutMustangsBack. We request you intervene to return the 45,000 captive wild horses and burros--now at risk of being KILLED by the Bureau of Land Management (BLM)--back on public land Herd Areas established with the 1971 Free Roaming Wild Horse and Burro Protection Act. The 45,000 captive wild horses and burros are being hoarded in taxpayer funded ranches and holding facilities to make room for commercial livestock, fracking and other industries on public land. The BLM makes more than $4.3 billion annually, so they should have taken care of the wild horses and burros they chased off public land to rake in all that profit. But the Wild Horse & Burro Advisory Board has recommended that the BLM kill all the captive 45,000 wild horses and burros they unjustly call "unadoptable". The BLM claims the 45,000 captive mustangs and burros are "unadoptable" because they were not picked at adoption events and thus received 3-Strikes or are over the age of 10 -- but that's not true. These adorable captive wild horses and burros were never given a fair chance at finding loving adoptive homes or sanctuaries. Since the BLM is not doing their job to publicize available wild horses and burros, and since their customer service is rotten, it's wrong to call the 45,000 captive wild horses and burros "unadoptable". They were not given a fair chance. Now that the BLM wants to KILL them all, we ask that you put them all back on public land to save tax-payer dollars and safeguard their lives. If needed, water wells could be drilled in Herd Areas thus still saving taxpayers millions of dollars. It's time to restore the natural ecological balance in the West, prevent catastrophic wildfires and #PutMustangsBack. 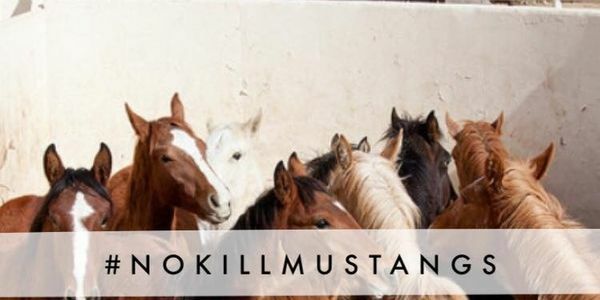 The new budget allows for killing and selling American mustangs to slaughter send this petition to everyone you know! This must be stopped in its tracks! URGENT: Calling all #MustangProtectors! Utah elected officials are trying to transfer federally protected WILD horses and burros to the states so they can KILL and SLAUGHTER them. With the new Administration the Mustang-Haters have a stronghold in Congress like never before! Share this petition widely every day and visit our website www.ProtectMustangs.org for updates. Together we can STOP the killing and Slaughter of America's WILD Horses! We have seen the BLM slither back after public outcry before, and that is all their recent statement is (http://bit.ly/2cL9hZ4). They have said nothing about not killing or stopping unlimited sales to slaughterhouse middlemen. Therefore it is more important than ever to keep the #NoKill pressure on and to push for wild horses and burros to be returned to freedom. Read more (http://protectmustangs.org/?p=9824) and please keep sharing the petition! It's 5 AM Sunday morning in California. We just passed the 600 signatures mark on the petition and it's growing thanks to you sharing! Please keep it up. Our goal is to have at least one signature per wild horse in holding to save their lives.